My polymeric sand job got rained on. What do I do? MY POLYMERIC SAND GOT RAINED ON. WHAT DO I DO? You’ve completed your polymeric sand job and followed all of the instructions to a T. And then … it rains. In this blog post, we’ll talk about what can potentially happen when a new polymeric sand application gets rained on. Heavy rainfall or watering is not good for a freshly finished polymeric sand job. So what happens if it rains following the installation? Well, the future life of that installation will ultimately depend on the circumstances. For example, if there’s a light rain several hours after the project has been finished, you’ll most likely be ok. 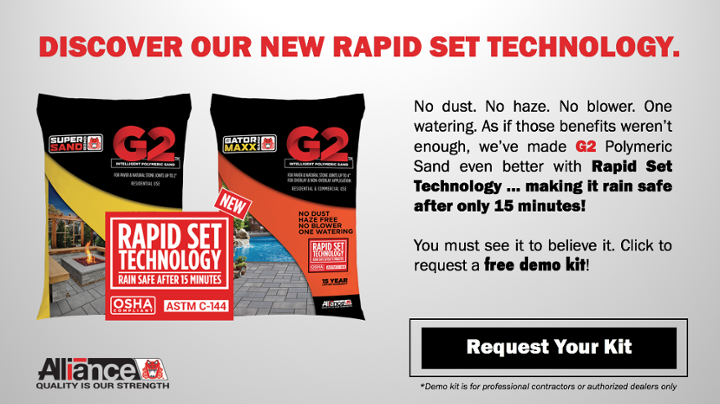 While each brand of sand will vary, Alliance Gator G2 Polymeric Sand with Rapid Set Technology is considered rainproof after 15 minutes at temperatures over 32° F degrees. That said, all polymeric sands have a window of time for setting up properly, which will depend on a wide variety of factors such as joint width, drainage, temperature, humidity, sun intensity, etc. However, one thing is for sure ... if joints get wet during the setting process, it will prolong the time it takes for the sand to fully cure. So how do you know when you have a real problem on your hands? If a tropical downpour takes place within that first hour, there’s a good chance that the polymeric sand will wash out of the joints and spill onto the surface of the pavers. Obviously, this creates multiple issues, including not having optimal levels of sand in the joints and the potential for the product later drying on top of the pavers. In this case, you’d be starting from square one once the weather conditions become optimal. To avoid this, we always recommend checking the weather before starting any polymeric sand job. If rainfall or high humidity is predicted for the day of your project, reschedule it for more optimal conditions. The takeaway here: while you can’t control the weather, you can certainly control many aspects of your polymeric sand job. Play it smart and don’t take risks if there’s significant rain in the forecast. If, by chance, you do get hit with some unexpected weather after your installation, don't panic. Let it dry out and make your assessment from there. For more information of the polymeric sand installation process, be sure to read our 10-Step Polymeric Sand Installation Guide.